Today marks the anniversary of the end of nearly 700 years of African Muslim rule over Spain, Portugal and Southern France. Four hundred and eight years ago today King Phillip III of Spain signed an order, which was one of the earliest examples of ethnic cleansing. At the height of the Spanish inquisition, King Phillip III ordered the expulsion of 300,000 Muslim Moriscos, which initiated one of the most brutal and tragic episodes in the history of Spain. Contrary to conventional wisdom, it was ancient Africans that brought civilization to Spain and large parts of Europe and not the other way around. The first civilization of Europe was established on the Greek island of Crete in 1700 BC and the Greeks were primarily civilized by the Black Africans of the Nile Valley. The Greeks then passed on this acquired culture to the Romans who ultimately lost it; thus, initiating the Dark Ages that lasted for five centuries. 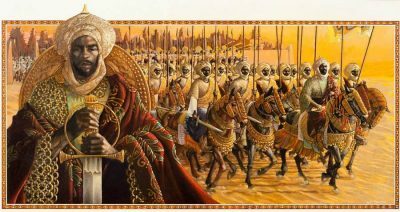 Civilization was once again reintroduced to Europe when another group of Black Africans, The Moors, brought the Dark Ages to an end. When history is taught in the West, the period called the “Middle Ages” is generally referred to as the “Dark Ages,” and depicted as the period during which civilization in general, including the arts and sciences, laid somewhat idle. This was certainly true for Europeans, but not for Africans. Renowned historian, Cheikh Anta Diop, explains how during the Middle Ages, the great empires of the world were Black empires, and the educational and cultural centers of the world were predominately African. Moreover, during that period, it was the Europeans who were the lawless barbarians. After the collapse of the Roman Empire multitudes of white warring tribes from the Caucasus were pushed into Western Europe by the invading Huns. The Moors invaded Spanish shores in 711 AD and African Muslims literally civilized the wild, white tribes from the Caucus. The Moors eventually ruled over Spain, Portugal, North Africa and southern France for over seven hundred years. Although generations of Spanish rulers have tried to expunge this era from the historical record, recent archaeology and scholarship now sheds new light on how Moorish advances in mathematics, astronomy, art, and philosophy helped propel Europe out of the Dark Ages and into the Renaissance. One the most famous British historians Basil Davidson, noted that during the eighth century there was no land “more admired by its neighbours, or more comfortable to live in, than a rich African civilization which took shape in Spain”. The Moors were unquestionably Black and the 16th century English playwright William Shakespeare used the word Moor as a synonym for African. Education was universal in Muslim Spain, while in Christian Europe, 99 percent of the population was illiterate, and even kings could neither read nor write. The Moors boasted a remarkably high literacy rate for a pre-modern society. During an era when Europe had only two universities, the Moors had seventeen. The founders of Oxford University were inspired to form the institution after visiting universities in Spain. According to the United Nations’ Education body, the oldest university operating in the world today, is the University of Al-Karaouine of Morocco founded during the height of the Moorish Empire in 859 A.D. by a Black woman named Fatima al-Fihri. In the realm of mathematics, the number zero (0), the Arabic numerals, and the decimal system were all introduced to Europe by Muslims, assisting them to solve problems far more quickly and accurately and laying the foundation for the Scientific Revolution. The Moors’ scientific curiosity extended to flight and polymath, Ibn Firnas, made the world’s first scientific attempt to fly in a controlled manner, in 875 A.D. Historical archives suggest that his attempt worked, but his landing was somewhat less successful. Africans took to the skies some six centuries before the Italian Leonardo Da Vinci developed a hang glider. Clearly, the Moors helped to lift the general European populace out of the Dark Ages, and paved the way for the Renaissance period. In fact, a large number of the traits on which modern Europe prides itself came to it from Muslim Spain, namely, free trade, diplomacy, open borders, etiquette, advanced seafaring, research methods, and key advances in chemistry. At a time when the Moors built 600 public baths and the rulers lived in sumptuous palaces, the monarchs of Germany, France, and England convinced their subjects that cleanliness was a sin and European kings dwelt in big barns, with no windows and no chimneys, often with only a hole in the roof for the exit of smoke. In the 10th century, Cordoba was not just the capital of Moorish Spain but also the most important and modern city in Europe. Cordoba boasted a population of half a million and had street lighting, fifty hospitals with running water, five hundred mosques and seventy libraries, one of which held over 500,000 books. All of these achievements occurred at a time when London had a predominantly illiterate population of around 20,000 and had largely forgotten the technical advances of the Romans some six hundred years before. Street lamps and paved streets did not appear in London or Paris until hundreds of years later. The Catholic Church forbade money lending which severely hampered any efforts at economic progress. Medieval Christian Europe was a miserable lot, which was riffe with squalor, barbarism, illiteracy, and mysticism. In Europe’s great Age of Exploration, Spain and Portugal were the leaders in global seafaring. It was the Moorish advances in navigational technology such as the astrolabe and sextant, as well as their improvements in cartography and shipbuilding, that paved the way for the Age of Exploration. Thus, the era of Western global dominance of the past half-millennium originated from the African Moorish sailors of the Iberian Peninsula during the 1300s. Long before Spanish Monarchs commissioned Columbus’ search for land to the West, African Muslims, amongst others, had long since established significant contact with the Americas and left a lasting impression on Native culture. One can only wonder how Columbus could have discovered America when a highly civilised and sophisticated people were watching him arrive from America’s shores? An overwhelming body of new evidence is emerging which proves that Africans had frequently sailed across the Atlantic to the Americas, many years before Columbus and indeed before Christ. Dr. Barry Fell of Harvard University highlights an array of evidence of Muslims in America before Columbus from sculptures, oral traditions, coins, eye-witness reports, ancient artifacts, Arabic documents and inscriptions. Muslim Spain not only collected and perpetuated the intellectual advances of Ancient Egypt, Greece and Roman civilisation, it also expanded on that civilisation and made its own vital contributions in fields ranging from astronomy, pharmacology, maritime navigation, architecture and law. The centuries old impression given by some Western scholars that the African continent made little or no contributions to civilization, and that its people are naturally primitive has, unfortunately, became the basis of racial prejudice, slavery, colonialism and the ongoing economic oppression of Africa. If Africans re-write their true history, they will reveal a glory that they will inevitably seek to recapture. After all, the greatest threat towards Africa having a glorious future is her people’s ignorance of Africa’s glorious past. Garikai Chengu is a scholar at Harvard University. Contact him on [email protected].